Mental rotation is one of the most influential paradigms in the history of cognitive psychology. In this paper, we present a new set of validated mental rotation stimuli to be used freely by the scientific community. Three-dimensional visual rendering software was employed to generate a total of 384 realistic-looking mental rotation stimuli with shading and foreshortening depth cues. Each stimulus was composed of two pictures: a baseline object and a target object, placed side by side, which can be aligned by means of a rotation around the vertical axis in half of the stimuli but not in the other half. Behavioral data (N=54, freely available) based on these stimuli exhibited the typical linear increase in response times and error rates with angular disparity, validating the stimulus set. This set of stimuli is especially useful for studies where it is necessary to avoid stimulus repetition, such as training studies. Few experiments in the history of psychology have spurred as much research interest as the seminal paper by Shepard and Metzler  on the mental rotation of drawings of three-dimensional objects. As of the writing of this article, according to Web of Science the original paper has been cited more than 2000 times, and there have been more than 5000 studies on mental rotation. These studies have spanned a broad range of topics, from exploring gender differences in mental rotation performance [2, 3] to the neural correlates of mental rotation in surgery residents , from the impact of virtual reality environments on mental rotation  to the effect of mental rotation training on other visuospatial tasks [6, 7]. 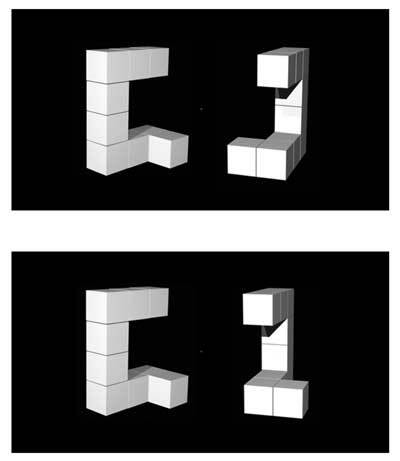 The stimuli in the original paper  consist of pairs of objects, each made up of 10 cubes connected face-to-face to form a pipe-like object with 4 connected arms and two free ends. In each stimulus, one of the objects in the pair is rotated relative to the other, and participants are asked to decide as quickly and as accurately as possible whether or not the two objects are the same, after mentally rotating one of them. The key finding is that response times and error rates increase linearly with the angular disparity between the two objects , suggesting that people transform internal representations of these objects incrementally, similarly to what takes place with rotations in physical space. This linear pattern is robust even to explicit experimental instructions to use other analytic strategies that would not yield a linear increase in response times , suggesting that the internal mental manipulation of objects is a fundamental cognitive ability that is automatically used to accurately respond to spatial challenges. Numerous studies have tried to test this idea and to pinpoint the cognitive and neural mechanisms underlying mental rotation processes. For instance, cognitive and neuroscientific studies have indicated that mental rotation processes rely on visual and motor representations [9, 10, 11, 12], and simultaneous psychometric modeling of reaction time and accuracy data from mental rotation experiments suggests that mental rotation can be considered a single, underlying ability . Mental rotation has been widely used over the last four decades to study visual spatial abilities because it is thought to tap into a key aspect of such abilities (e.g. [14, 15, 16]), though the precise relationship between mental rotation and visual spatial abilities is still under debate. For example, mental rotation was treated as a category of spatial ability different from spatial perception and spatial visualization in the seminal meta-analysis by Linn and Petersen . A more recent typology of spatial abilities is consistent with this classification but also identified two important dimensions: intrinsic vs. extrinsic and static vs. dynamic information . The first dimension refers to whether spatial information needs to be evaluated within an object or between objects, whereas the second has to do with whether the spatial information is static or dynamic. Thus, according to this typology, typically mental rotation would involve intrinsic and dynamic information, as the task requires assessing spatial information about an object and performing a mental transformation on the object. Furthermore, the classic mental rotation task may also involve extrinsic information, as it requires comparing two objects. Regardless of the precise relationship between mental rotation and spatial skills, research has shown that mental rotation ability predicts a broad range of competence and performance variables, from math scores and achievement [17, 18] to surgical skills , and that spatial skills play a key role in science, technology, engineering, and mathematics (STEM). Because of this link, one important line of research has focused on determining whether mental rotation and related spatial skills can be improved by means of training  as a potential way of improving performance in STEM and related fields. A key goal of these training studies is to assess the extent to which training with a particular task and set of stimuli generalizes to new tasks and stimuli [7, 16]. To be able to test generalization, it is important to have a sufficiently large set of stimuli so that different stimuli are used in the training and testing sessions. The original set of Shepard and Metzler stimuli, for instance, only has 10 distinct objects, and a more recent set by Peters and Battista has 16 . Furthermore, given the variety of types of spatial skills mentioned earlier, it is also important to generate stimuli that tap primarily into one type. For instance, the original Shepard and Metzler objects were line drawings with occlusion and perspective depth cues, but without shading cues . This may have resulted in crowding (i.e., difficulties in parsing object edges at some orientations where object surfaces closer to the viewer partially occluded surfaces farther away) and depth ambiguity (i.e., ambiguity about whether parts of the object extend away or towards the viewer) in the stimuli. To overcome these issues, we used three-dimensional modeling software to generate a new set of 48 distinct mental rotation objects and their rotated versions with shading depth cues. This stimulus set improves and expands on a similar set that was used in a previous study . Furthermore, this set is made available to the scientific community, as detailed below. This study presents a newly created set of mental rotation stimuli, to be used by the greater community of cognitive psychologists and neuroscientists. Below, we describe the creation of the stimuli in detail. In the second section, we describe the validation of a representative subset of these stimuli on a sample (N=54) of psychology students. Both the stimuli (N=384) and the raw behavioural data (N=54) are made freely available to the community for further use and analysis. A traditional Shepard and Metzler stimulus is composed of a pair of three-dimensional objects: the baseline object, usually on the left, has to be compared to a target object, on the right. In the typical mental rotation task, participants are asked to mentally rotate the target object to determine whether it can be brought into alignment with the baseline object by means of a rotation. Thus, there are two types of stimuli: “same” stimuli, where the two objects can be made to coincide with each other via rotation, and “different” stimuli, where this is not possible. We generated a set of stimuli with a larger number of distinct objects and with additional depth cues compared to the original Shepard and Metzler stimulus set. To do so, we created 48 three-dimensional Shepard and Metzler objects using Bryce 3D (version 6, ), specialized software for modeling and rendering realistic three-dimensional objects. To generate a range of angular disparities, one constraint was to minimize self-occlusion at all views used. For uniformity, we wanted to generate the same set of angular disparities for all objects and so four angles were chosen: 0, 50, 100 and 150 degrees. 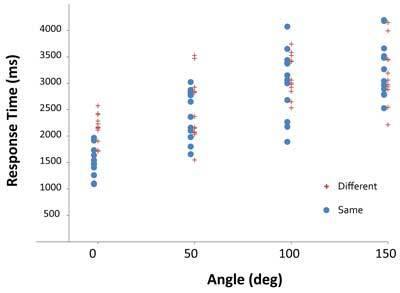 These angular disparities reflect most of the behavioral range typically used in mental rotation studies without causing significant self-occlusion at any of the orientations. Although smaller angular increments are possible, they often cause occlusion of relevant spatial information for some orientations. For each stimulus, two objects were used, differing in orientation by one of the four angles mentioned above. All objects were white on a black background, and each consisted of 7 to 11 cubes with sides equal to 20 Bryce units, a universal measure used in Bryce 3D. All objects consisted of 4 arms, connected end-to-end in a sequence, as in the original Shepard and Metzler stimuli. To create a natural-looking shading effect, two light sources were employed. The first was the integrated night-time backlight that is the default setting in Bryce. The second was a cone light placed at 650 Bryce-units away from the object. These lights varied in intensity between 300 and 400 Bryce-units of illumination, depending on the orientation, to create a uniform level of brightness. For each of the stimuli, we ensured the shading effects were not so prominent as to cast shadows that could be confused with object edges. The configurations and details for each stimulus are listed in Table 2 and Supplementary Figure 1. As shown in Figure 1, each stimulus was generated by placing two objects on a 28 cm x 14.5 cm black rectangle (26.2° x 13.7° visual angle, when viewed from a distance of 60 cm). The object on the left is always one of the 48 baseline objects (0 degree angular disparity). For the ‘same’ stimuli, the object on the right is the same as the one on the left, but is rotated around the vertical axis by 50, 100 or 150 degrees clockwise (when observed from above). This axis usually shows the fastest rate of mental rotation [22, 23]. Each ‘different’ stimulus was generated from the corresponding same stimulus by creating a pseudo-mirror image target object (often by flipping one of the end arms) such that it could not be brought to coincide with the baseline object by means of a rotation around the vertical axis. In all other respects, such as the number of blocks and the configuration of the arms, the objects in the same and different stimuli were identical, which is critical to ensure the task cannot be carried out merely by detecting differences in the number of cubes in the objects. Although the angle of rotation for the different stimuli is, strictly speaking, indeterminate (i.e., there is no rotation around the vertical axis that can bring the two objects to coincide), the angle or rotation in these trials was inherited from the parent same trials as the two figures can still be brought in partial register with one another . Note that the two objects in the different versions of stimuli 29 and 48 (Supplementary Figure 1) can actually be brought in register with a rotation around a non-vertical axis (but not around the vertical axis). For each of the 48 baseline objects, we generated 4 same stimuli and 4 different stimuli at each of the 4 angular disparities, for a total of 384 stimuli. To validate this new stimulus set, behavioral data was obtained from a group of participants using a representative subset of the stimuli. A subset of 96 stimuli from the full set of 384 was used for the validation (see below and in bold in Table 2), employing 12 out of the possible 48 baseline objects, each with its 4 rotations in the same and different versions. Mean mental rotation Response Times (RTs, in milliseconds) and Error Rates (%E, in percent) with standard errors (SE), as a function of angle or rotation. Cube naming scheme for the 48 baseline objects. For instance, “2_3_3_2” means that the corresponding object is composed of a sequence of 4 connected arms of length 2, 3, 3, and 2 cubes, respectively. More than one distinct object can be generated from a given cube sequence. This is indicated by the letters at the end of the cube sequence descriptors. The stimuli in bold were used in the validation study. Example of mental rotation stimuli. At the top is an example of a “same” stimulus in which the object on the right can be put in congruency with the baseline object on the left by a rotation around the vertical axis. At the bottom is an example of a “different” stimulus, for which this is not possible. The angular disparity between the two objects in this case is 150 degrees. Fifty four participants (31 females, mean age = 22.3, SD = 4 years) were tested with the stimulus set. All participants were right handed, were free from neurological or psychiatric disorders, and had normal or corrected vision. All participants provided written consent and received either $10 or class credit for their participation. Participants were tested in accordance with national and international norms governing the use of human research participants. The study was approved by the Harvard University Faculty of Arts and Sciences Committee on the Use of Human Subjects. Participants were tested individually, sitting approximately 60 cm from a computer screen. First, participants were shown written instructions about the mental rotation task. Next, an example of a trial was shown, illustrating the way the instructions should be followed. Finally, participants were asked to paraphrase the instructions to ensure that they understood them. Each trial started with a 250 millisecond (ms) blank screen, after which one of the stimuli was presented until participants responded by pressing one of two buttons, with a time limit of 7500 ms. Participants were instructed to respond as fast as possible, without sacrificing accuracy. Participants used their dominant hand to respond, pressing the “b” key if they decided that the objects in a pair were the same and the “n” key is they decided the two objects were different. Participants carried out two blocks of 48 trials, for a total of 96 trials. In each block, the four orientations occurred equally often. On half of the trials, the objects in a pair were the same, with the exception of rotation. The order of the trials was randomized, but no more than three same or different trials occurred consecutively. In each task, before the first experimental trial, participants performed 12 practice trials using stimuli not used in the actual experiment, where the computer provided feedback on their answer. Figure 2 and Table 1 show the average response times (RTs) and error rates for the four angles of rotation (with data from same and different trials collapsed), together with the best-fit regression lines. Figure 3 shows the average RTs for each of the 96 stimuli. Only correct trials went into the analyses and trials were removed from the analyses for each participant if they were not within plus or minus two standard deviations of the mean, calculated for each level of rotation and trial type separately (less than 2%). A two-way repeated measures ANOVA with angle of rotation (0, 50, 100, and 150 degrees) and trial type (same, different) as factors showed that RTs increased with angle of rotation, F(3,159)=160.81, p<.0001, η2p=.75. Different trials were slower than same trials, F(1,53)=17.86, p<.0001, η2p=.25, and this effect varied by angle of rotation, F(3,159)=20.83, p<.0001, η2p=.28. A linear contrast indicated that RTs increased linearly with angle of rotation F(1,53)=237.70, p<.0001, η2p=.82, although the quadratic component was also significant, F(1,53)=29.14, p<.0001, η2p=.36. A similar analysis showed that error rates also increased with angle of rotation, F(1,159)=34.99, p<.0001, η2p=.40. There was no main effect of trial type, F(1,53)=.13, p>.1, η2p=.36, but error rates tended to be lower for same than different trials at the smallest angles of rotation, whereas they tended to be higher at the largest angles of rotation. This was shown by the interaction between angle of rotation and trial type, F(3,159)=6.39, p<.0001, η2p=.11. A linear contrast showed that error rates increased in a linear manner with angle of rotation, F(1,53)=61.23,p<.0001, η2p=.54. The quadratic component in this case was not significant, F(1,53)=3.60,p>.05, η2p=.06. Results of the validation study. 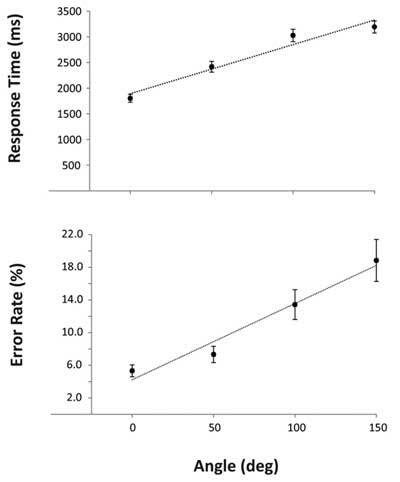 Mean response times (top) and error rates (bottom) are shown as a function of angle of rotation for the subset of 96 stimuli used in the study. Only data from correct trials are included in the response times graph. Single stimulus data. Mean response times for each stimulus used in the study are shown, broken down by trial type and angular disparity. The equation of the best-fit regression line for RTs as a function of angle of rotation was y=9.56x + 1891.3, meaning that RTs increased approximately by 10 ms per degree of rotation between object (a mental rotation speed of about 100 degrees per second). This speed is higher than the than 60 degree per second found with the original Shepard and Metzler objects in a comparable condition with fixed axis and in-depth rotation (, Figure 3.4). The faster mental rotation speed with these stimuli may be due to one or more of the following factors: i) using a vertical rotation axis, which is the fastest axis for rotations in depth , ii) the additional shading cues, which may have resulted in a more accurate three-dimensional representation of the stimuli to be rotated, iii) the Flynn effect . The equation of the best-fit regression line for error rates is y=0.093 + 4.24, meaning that error rates increase by about 0.1% per degree. None of the results changed after removing the different trials for stimulus 29 in which the two objects could be brought in register with a rotation around a non-vertical axis. These results provide a validation of the new stimulus dataset. First, as in previous metal rotation studies using the original Shepard and Metzler stimuli, both RTs and error rates increase with angle of rotation. This increase is largely linear, but there is a flattening out of the RTs at the largest angle of rotation (150 degrees), which explains the presence of a quadratic component. This pattern is close to that found in a previous study using similar stimuli (, Figure 5). Furthermore, a similar pattern is also visible in some of the early work conducted using the Shepard and Metzler stimuli (, Figure 3.5). Second, the RTs for same trials are shorter than those for different trials, also consistent with early mental rotation work . This effect is thought to be due to mental rotation processes required to bring the two objects in partial congruence with each other plus additional time needed to determine that one of the arms of the two objects cannot be matched. These stimuli should be especially useful for experiments that require separate study and test subsets to avoid repetition, such as those investigating the effects of mental rotation training that need to assess the generalization of effects to new stimuli . To this end, the stimulus set can be easily divided into 2 to 4 independent subsets, depending on the design of the study, with each subset still providing 24 trials per rotation level (after averaging same and different trials). Mental rotation abilities are an important component of spatial intelligence. The raw data from this study can be used in meta-analyses of mental rotation and spatial intelligence, as well as to investigate numerous questions about mental rotation with the new stimulus set. Examples of such questions include inter-individual variability in mental rotation, the size of effects, and the linearity of mental rotation angle effects. The stimulus set itself can be used for any mental rotation study, but is especially useful for experiments that require a relatively large number of different stimuli, such as those investigating skill learning effects . Supporting Figure 1. Thumbnails of the 384 mental rotation stimuli (TIF). Each row has a distinct baseline object (on the left) and includes eight stimuli corresponding to the factorial combination of four angles of rotation (0, 50, 100, and 150 degrees) and same vs. different target objects (indicated with the “R” suffix). This work was supported by the National Science Foundation under Grants SBE-0823506 to Giorgio Ganis and REC-0411725 to Stephen Kosslyn. Brandt, M. G. and Davies, E. T. (2006). Visual-spatial ability, learning modality and surgical knot tying. Canadian Journal of Surgery 49(6): 412–416. Shepard, R. N. and Cooper, L. A. (1982). Mental images and their transformations In: Cambridge, MA: The MIT Press.